I was so excited to make this Anti-Itch Soap that as soon as my husband walked in the door I declared, “I made Poison Ivy Soap!” He looked at me oddly and said, “I hope you didn’t put poison ivy in soap, Kelly.” That made me laugh. I guess he doesn’t know what I’m going to do next sometimes. But, no! This soap contains NO poison ivy. Instead, it is made with a wonderful weed called Jewelweed. 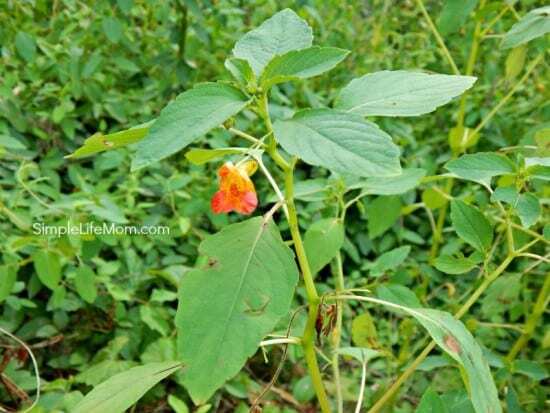 Jewelweed, a.k.a. Touch Me Not, Impatiens, Snap Weed, and whatever your grandma calls it, has a number of nicknames because it’s common in most wooded areas of America and Europe. It likes the shade and access to plenty of water. This is because its root system is very shallow. If you try to break off a stem you are likely to pull up the entire plant. My kids learned quickly that you can eat the seed pods. They are called Snap Weed or Touch Me Nots, because when the pods are ready they will snap open at the slightest touch. These are fine to eat, but it is well known that the rest of the plant is poisonous. Jewelweed flowers in North Eastern America in mid-July. They almost look like little snap dragons on 3 foot high stalks or small bushes with tear drop leaves. The flowers will either be yellow (Pale Jewelweed) or orange with red spots (Spotted Jewelweed). Jewelweed has a liquid inside of the stem and leaves that neutralizes Urushial (the chemical that makes you itch in poison ivy, sumac, and poison oak). You can get to it by simply breaking and crushing the stem in your fist..or by smashing it with a hammer – whatever makes you feel good. This liquid can be used right away on a burn or rash. If you’ve been hiking or cutting grass with Poison Ivy. Take a second and crush Jewelweed and rub it on that skin. The second thing you should do is wash the oils off – just in case you missed any, or it’s not Jewelweed season, or you don’t have any growing in your back yard. Just like you’d get grease off a greasy dish, you want to work to make sure the poison ivy oil is off of your skin. If you do this right after you are exposed, then you probably won’t break out at all!! Awesome, right? Jewelweed soap is a soap made with Jewelweed infused water and oils. It is packed with Jewelweed! I also recommend using camphor essential oil in your soap. This will help to calm any irritated skin and soothes itching if you are already starting to break out. Just as I said above, the key is using it immediately after exposure and scrubbing down to make sure you don’t give the poison ivy oils time to penetrate to deeper layers of skin. 1) Collect Jewelweed – If it’s growing prolifically in your area, just pull up. 2) Infuse Water – Place water in a large pot (a little more than enough because some will evaporate). Fold up and smash some Jewelweed. You can cut it with a knife, or just bend and smash with your hands. Put the Jewelweed in the water and heat on low until the water is a dark golden color. Strain water through fine sieve and discard Jewelweed. 3) Infuse Oils – Weigh and combine your coconut and olive oils into a pot and add crushed Jewelweed. Simmer on very low for an hour or until the oils are a bright green (Yes, bright green and it’s beautiful! **Spoiler – It doesn’t last in the soap though). Strain oil through fine sieve and discard Jewelweed. Jewelweed infused into the oil and water ahead of time. Combine Tallow and Jewelweed infused Coconut Oil and Olive Oil (see instructions above). Heat (or cool) to 95 degrees F.
Go OUTSIDE and add Lye slowly to Jewelweed infused water. This is turn the water a bright orange color if you add it too quickly. Unlike soaps made with milk, this color will disappear in the soap. Cool to 95 degrees F.
Add lye water to oils and mix with a stick or hand mixer until light trace. Pour into mold and incubate for 24 hours before removing. For More Detailed instructions on how to make cold processed soap, see: 7 Easy Steps to Homemade Lye Soap for Beginners. This sounds great! We gave so much poison ivy in the woods by our house. We even get it just owing the yard. I can’t wait to try your soap. Could you do milk instead of water? I have goats & would love to make this a goat milk soap. Yes. I would use half water, half milk. Infuse the water until it is very concentrated, cool, and use with your goat’s milk as the rest of the liquid. Remember to add the lye very slowly. It may take up to an hour to add all of the lye. If you add too fast and scald the milk it still works, you’ll just have a much darker soap. Hello Heather…I know this is probably a very long long shot since your post dates back to 2015…I’m interested in making this soap using jewelweed & we also have goats…I was wondering how yours turned out & how happy you are with it’s results…?….We have tons of poison oak around the ranch & whenever the cattle or sheep or goats get into it..well you can just imagine…I look forward to hearing from you..Thank you, Teri….I Wish you and your family a Fabulous & Blessed Day! Can you just use the infused oil to gain the same anti-itch effect? You can just infuse the oil, but you’ll get half the amount of Jewelweed in the soap. I’m sure it will still be helpful, maybe just not as powerful. My sister-in-law made poison ivy body butter as well as poison ivy soap. What’s amazing is that I’ve been using it for my sons yeast infection, and it’s making a huge difference! I’m not sure which oils she used as an antifungal but it is awesome! I also make cp soaps and found your post while doing a search to see if the healing effects of jewelweed are effected by the gel phase in cp soap. By testimony it would appear that it does not. Thanks for sharing! Nicely done post! Thank you Tori. Yes, it’s definitely not as strong as if you put the liquid on straight, but to have something handy or to use both is great. It definitely helped my son tremendously this summer (bad case all over his face that we caught quickly). I am wondering how much jewelweed to use to infuse the oil. I do not have fresh jewelweed to use so I have to use dried, but I no idea how much to use per pound of oils. I’ve always just smashed as much as I can into a pot and covered with oil. The issue with using dried jewelweed is that you are not getting oils that you would if it were fresh, so I’m not sure about the effectiveness. If you wan to give it a try, I’d use 1-2 Tbsp per cup of oil to start. Heat gently for a few minutes (I would pour it through a fine sieve like a t-shirt) and seal in a jar until use. I have an abundance of jewelweed that grew in my yard. I cut it in pieces and ran it through a juicer and froze it in ice cube pieces. Do you think it still has its medicinal properties? How would you suggest using it in the recipe – as a replacement for the full water? Would this alleviate the necessity to infuse it in oil or water? Would you please send me a PM via email? Hi Gail. We talked via email, but for others I wanted to say here, frozen juice should have all the same properties to help in this batch. I would sub for all my water. Infuse oil as well (if you can) just for even more jewelweed in your soap (if not, that’s ok). 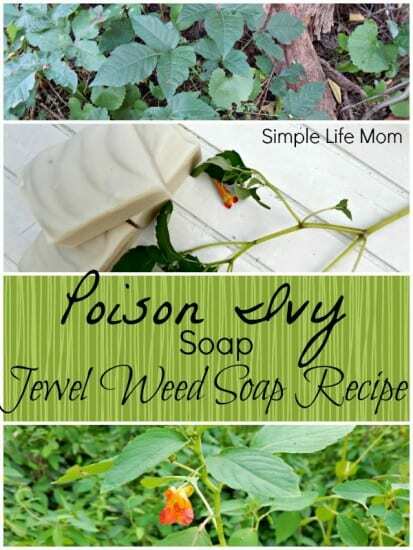 Hi Kelly, I want to make the poison ivy soap, but do not have Jewelweed, looking online I find only seeds(very expsive seeds!) Can you tell me where I can find the plants to grow, as I saw where info said it’s difficult to start from seed. Thank you so much….. I did the same thing and also found poor pickings. THEN I was driving down the road and saw some literally 400 meters from my house!! If you are in the US, what part of the country? You may have some grow in the area and can take some nature hikes to find some. I just FINALLY got some jewelweed today and am dying to make some soap. What ‘parts’ of the plant do I use to infuse and how much do I use in how much oil? I’ve been making soap for years but this type is new to me! Thank you so much!! Use everything but the roots. Chop it roughly and stuff it down into a pot with enough water to cover. Repeat with the oil as well. Where you can bring the water to a simmer, I would not do that with the oil unless it is coconut as you will damage the oil. Just heat on low. You’ll see the water and oil become a dark color and you’re ready. 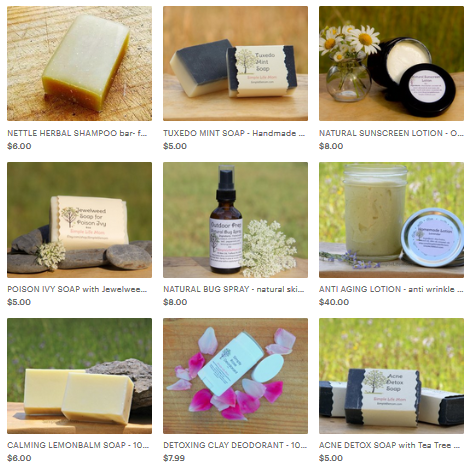 what oil could I sub for tallow in the soap? First Thank you for having this website! For step #1 it doesn’t mention how much Jewelweed water to use. I want to make this soap using this recipe but am confused on the amount of jewelweed water. Is the 10oz of water the jewelweed infused water? And can you tell me how many bars or what the yield is on this recipe? If you want to infuse the water, then follow thw instructions to infuse it and use it instead of your 10oz in the recipe. This recipe is for a 2.5 pound batch. Thank you, I’m just waiting for the camphor to arrive so I can make this soap! Can you use this on a regular basis? Yes you can. Camphor had been shown to be detoxing to the skin and liver and I haven’t heard of any sensitization from jeweled in this manner. I appreciate the recipe, however my bars turned out very brittle – so I’m a bit perplexed–not sure why– I’ll have to do some investigating — my husband loves the camphor — (he seems to get in poison ivy often) They are still usable, but not as “moist” as the soap I usually make. What you are describing sounds like your soap is lye heavy. You can hot process it and add a little bit of water as you do so. This should fix your problem. My recipe is not lye heavy so I’m guessing some accident happened with the lye or oils, or there’s a difference in altitude. Hope that helps. I live in Kansas and don’t have jewelweed where I live. How much jewelweed essential oil would I use in this recipe in place of infused oil with natural jewelweed? There’s not a jewelweed essential oil, but you can find jewelweed infused oil online. You can also use other herbs like goldenseal and plantain. They don’t have quite the same effect, but are very soothing and healing for the skin. Hello. I just received a 2 oz. bottle of Jewelweed Extract. Can that be used to make bar soap? Thanks! Im guessing it was extracted in an alcohol, which does not hold well in soapmaking. You could add it to your lye water, but I think you’d get more out of it if you saved it and spread a few drops on areas of your skin that may have been infected with poison ivy and oak oils. Do you know if I could use a melt and pour soap base for this? I’m not a soap maker and a little scared of trying out the lye and such. Thanks! No, you can’t use infused oil or water with melt and pour. The oil and water has already been emulsified and saponified. The soap wouldn’t set up again. You shouldn’t be scared of working with lye. Just don’t breathe the fumes for a minute after mixing it with water and don’t touch it. You should go for it. ? I’ve used it in melt and pour for over 20 years… you have to boil the jewelweed in water, then boil that down til it is dark brownish orange. 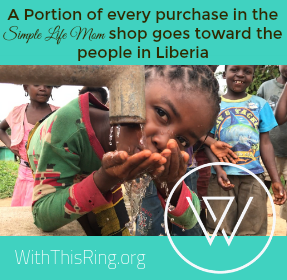 You can add a cup for every 4 pounds of soap. You need to use what is called “Low Sweat” melt and pour soap, because it has less moisture. 2.5 lbs makes about 10 – 4oz bars, depending on the water content the bars maintain or lose as they cure. Hi, I just made this soap, but I just wanted to make sure I did it right. All measurements are in volume, not weight, right? It is by weight, but it should be fine. The measurements are pretty close. I’m confused. Your instructions say to discard the jewelweed after infusing, but then you say to add crushed jewelweed to the soap. 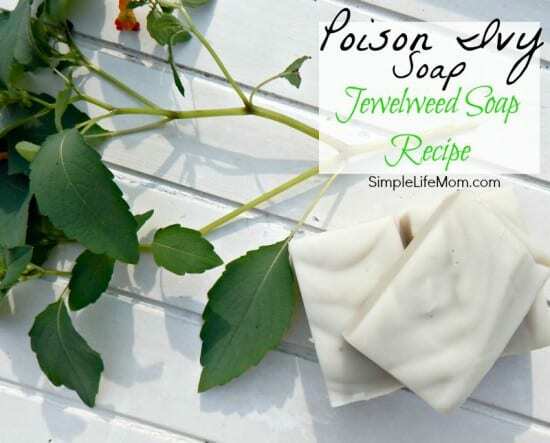 How do you get the jewelweed water into the soap? It says to add crushed jewelweed to the oil. You will infuse the water and then the oil so divide your fresh jewelweed in half so that you have some for both. Infusing in the water and the oil insures that you are getting the most jewelweed into the soap. Oh! Thank you. I realize now those were separate from the recipe. How do I get that pink color? I loved your bar that shows half natural soap color and the other half a pink calamine lotion color. How can I achieve that calamine color? It’s a combination of rose clay and Moroccan clay.